It hardly seems like it's been a whole month, but the Shiloh Singers' December singing had a good group of 13 singers on Sunday afternoon, December 9th. As usual, we were in the Country Store on the grounds of the Shiloh Museum of Ozark History in Springdale. This was the second month on our new schedule of singing on the 2nd Sunday of each month. We were also honored to have a visiting singer from Tallahassee, FL at our Sunday's singing. Angela Mele, a biological illustrator, is working with a professor at the Univ. of Arkansas for several days. Angela also attended the recent Florida State Singing Convention in Panama City, FL and she helped our group in several different sections during the afternoon. "The convention was held at a Holiday Inn. I booked a room, and it was fantastic to just get up and go downstairs to the singing. It was really convenient. A brand new version of the Cooper Book has just been released, and I got a copy while I was at the convention. 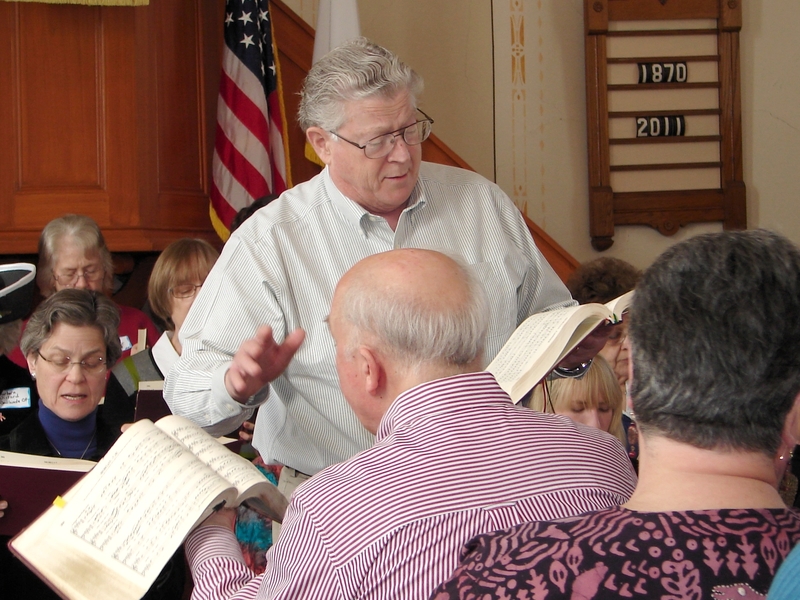 "I sang Sacred Harp recently at a little Baptist college in Graceville. It was a public demo. A lot of people came and listened. After that, a dulcimer group played. I've contacted them about having a look at a dulcimer that my father made for me. I don't really know much about dulcimers, so maybe they can help me out." Shannon added that she's also singing with a church choir that's performing Handel's Messiah for Christmas Eve, which involves singing and playing the hand bells at the same time. Those of us in Arkansas appreciated Shannon's musical talents for some time. Florida has gained a very fine singer this past year. At our November 12th singing, Syd Caldwell brought several DVD's from the United Convention in Henagar in September and the Memorial Singing Convention in Oneonta in October. Several singers requested copies which were distributed at the December singing this past Sunday. Additional copies will be sent to those who were not able to attend on Sunday due to illness or schedule conflicts. Special thanks to the cooks who baked cookies to go with the coffee and soft drinks during the break. Dan Brittain, pitched a "double-header" on Sunday, first performing in a Christmas band concert and then arriving at the Shiloh singing shortly after the break to sing in the second half of our event. On November 27th, Katy and I had a chance to visit with Anita and Don Buswell in Mountain Home. While Don requires oxygen now, he was moving around the house with a walker when we arrived. Don said he was feeling stronger and Anita added that Don does better and seems to get stronger at home. She also said that she and Don miss our monthly singings and we certainly miss them both as well. 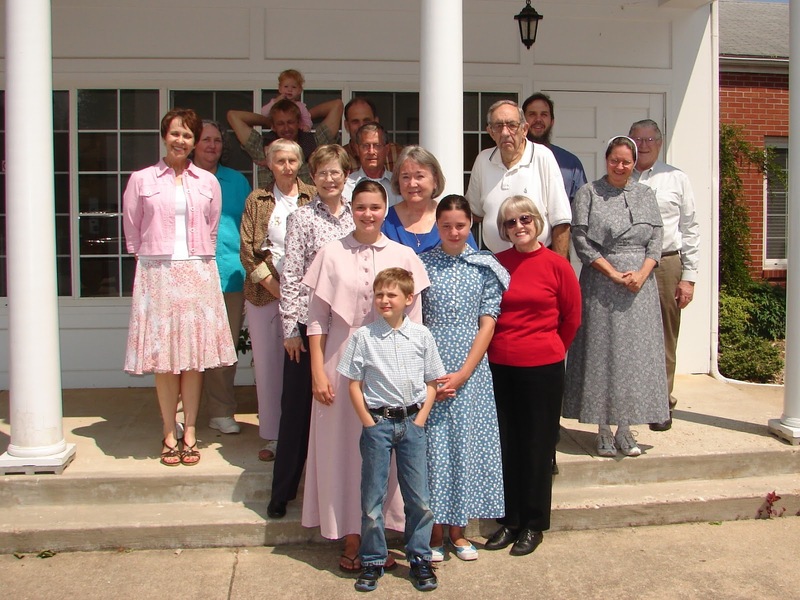 The next regular singing of the Shiloh Sacred Harp Singers will be on January 13, 2013 at 1:30 P.M. in the Shiloh Museum's Country Store in Springdale. 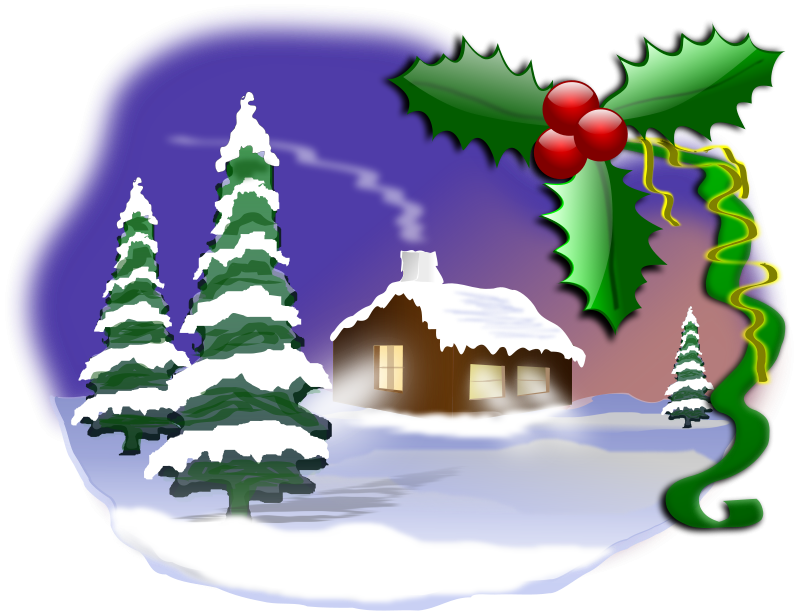 Syd is still working to arrange a possible "get-together and singing" with Cheri Hardy from Massachusetts who will be visiting our area over the Christmas holidays - Dec. 22 to Jan. 2. Several singers said they would try to attend if their schedules permitted. We'll use the email list to get the word out as soon as details can be worked out. I have always marveled how Sacred Harp Singings, the annual inch-thick book that contains the minutes of our various singing events covers so much in such compact form. When you see next year's minute book, with the record of Saturday's singing, you'll find only a single mention of the discussions regarding changing the Sunday of the month when we sing. "[W]e completed a discussion by agreeing to change our regular monthly singing to the 2nd Sunday of the month, effective in November." As one of those who followed some of those discussions during the previous two months, I can add that we tried to consider everyone's input and schedules in the decision process. Mentions on the website and online discussions moved to conversations during Saturday's breaks, then at lunch and finally during the business portion of the meeting. In a surprise twist, it seemed that the best monthly singing date, the one that most people thought they could attend on a regular basis, was the 2nd Sunday of each month. Thus the Shiloh Singers will be singing on November 11th and December 9th. Please mark your calendars accordingly. You'll also find the date changes noted in the calendar section . The change to the 2nd Sunday certainly solves our yearly conflicts with Thanksgiving and Christmas plus several local events on the 3rd and 4th Sundays. The only potential conflict noted was the Missouri State Singing Convention on March 9th & 10th and Mother's Day on May 12th. Well, we have a few months to work on something creative for the Missouri State Convention in March. The Missouri State Convention is one of the best regional conventions in our area each year. We usually have a good representation from the Shiloh Singers at the Missouri event. If you missed the singing at Mt. Comfort Presbyterian Church in Fayetteville on October 27th, the weather was a little chilly but Rev. Randi Henderson and members of the congregation provided a warm welcome and extended their hospitality to singers from Texas, Oklahoma, Missouri and of course, Arkansas. The Shiloh Singers once again proved they have plenty of good cooks and while the weather suggested we eat inside, there were more choices of main dishes and desserts than would fit comfortably on a single plate. Singers at the NW Arkansas Singing Convention on 10/27/12. Dan Brittain, having just returned from singing in the United Kingdom and Poland, noted the European custom of not only remembering departed singers and those sick or unable to attend in the memorial service. The singers in the UK and Poland also offer a thanksgiving for recent blessings. It seemed like a tradition worthy of sharing. We all have so many reasons to be thankful. Syd Caldwell mentioned that he had several non-commercial CDs and DVDs to share from singings around the country. He wanted to know if anyone might like a copy to play or just sing along with while traveling or working. I'll make a note to bring my laptop and speakers to the November 11th singing so that we can preview a few of the songs during our break and people can sign-up for a copy which can be distributed at the December singing. Our special thanks to the members of Mt. Comfort Presbyterian Church for all their hospitality for the past two years. The church had their Fall Festival and Chili Supper later the same afternoon. Rev. Randi and family arrived in Iowa safe and sound at the church she will now serve, and we wish her all the best at her new church. Thanks to all the singers who attended, the cooks and all who worked to make the annual Fall singing a special event. 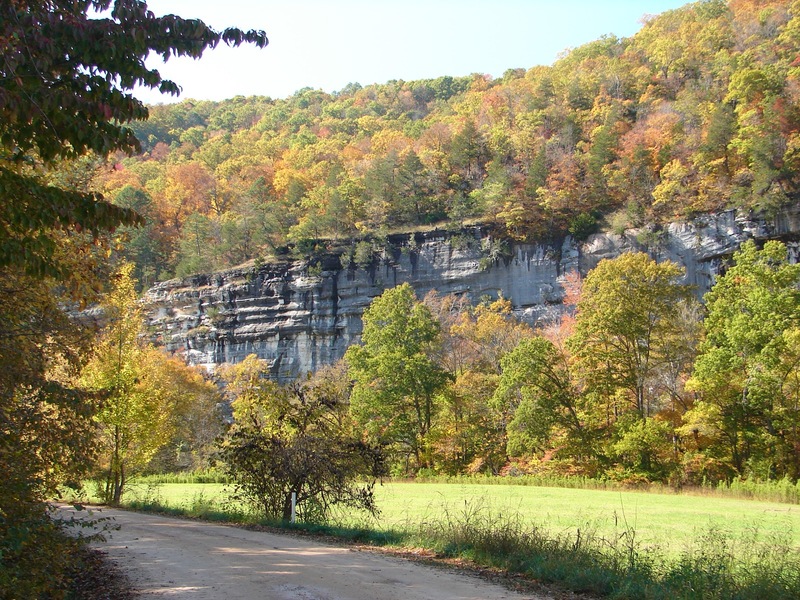 Fall colors in Buffalo River National Park. Thanks to all who have been planning for the Annual Fall Singing at Mount Comfort Presbyterian Church in Springdale on October 27th from 9:30 A.M. to 2:30 P.M. We certainly hope singers from the entire region will consider attending this annual Fall event. The leaves in NWA have started turning into brilliant red and gold. Thus the drive to Fayetteville may be both appetizer and dessert in addition to a fine day of singing. Speaking of desserts, one of my favorite topics, there will be a "pot-luck" noon meal. The cooks in our group provided a wonderful spread last year and Mt. Comfort's Fellowship Hall has a kitchen with facilities for warming or keeping items cool in addition to the usual coolers members bring for soft drinks and water. If you already know what you plan to bring or need any suggestions, you can send me an email and I'll try to help match needs and responses. My favorite long range weather forecast site anticipates sunny weather and temperatures in the mid-70's, so sitting outside in the shade under the trees in the Fall air may allow us to continue the "dinner on the grounds" tradition that has been enjoyed by Sacred Harp singers for so many generations. If you arrive early, Syd Caldwell plans to be there about 8:30 to make the coffee and could always use help setting up the chairs. But wait! There's more! Rev. Randi Henderson reminded me that Mt. Comfort Presbyterian Church also plans to have their annual Fall Festival after the singing is concluded at 2:30. All the singers are invited to stay and enjoy games for the children, an old fashioned cake walk, entertainment by a local folk group called Sugar on the Floor and a chili supper. Supper is $5 a person, max $15 a family, all you care to eat. Some of the singers who have traveled the longer distances will use the 2:30 ending time to still get home Saturday evening. Those that only live an hour or two away may want to enjoy the rest of the afternoon and then head home having been fortified by a chili supper. 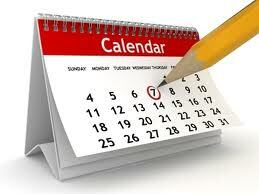 Calendar Changes - There was general agreement in discussions about changing the October and November Sunday singing dates. (Please check the calendar at the top of the sidebar for the latest info.) On the other hand, both the 3rd and 4th Sunday drew their share of pros and cons. More than one suggestion included asking if moving our regular singing date to the 3rd Sunday each month would resolve both the November and December holiday issues as well as issues for some people who have schedule conflicts on the 4th Sunday. New family circumstances and schedule changes are a fact of life. Maybe we need to ask if there is a better Sunday to sing than the one we've been using. Adjusting singing dates to accommodate the most singers certainly makes sense. There's nothing "sacred" about the 4th Sunday if that's not the best date for our singers. We might need to change some webpages and a few calendars, but this looks like something we need to talk about on a wider scale than just November and December. Look at your own calendars and bring your best ideas to the Fall Singing on October 27th. If you cannot attend the Fall singing, then at the very least send an email so we can include your input. Then, let's spend a few minutes before a break or lunch to see what we can decide to help the most people. If you're in the Fayetteville/Springdale area on Friday night, the Shiloh Museum's annual Beans & Cornbread Supper is scheduled for Friday, October 26, from 4:30-6:45 p.m. in the Springdale High School rotunda. While you’re there, enjoy a photo exhibit on Springdale’s school athletic history. Then you can walk over to nearby Bulldog Stadium, for the Springdale Bulldogs vs. the Bentonville Tigers football game at 7:30 p.m.
Advance tickets are available for $6 at the museum or $8 at the door. Feed your whole family for $24, The proceeds go to support the Shiloh Museum and the Springdale Athletic Foundation. August was another dry month in Bentonville but there's been some rain in NW Arkansas. We were thankful for every rain drop that's fallen on our small hill side in Mountainburg. Garrett Lewis, the chief meteorologist for KFSM-TV, had already forecast a high probability of showers and thunderstorms in NWA for Sunday, August 26th. Some of the rains were locally very heavy and travel wasn't optimum to say the least. With August being the last chance for summer travel, family illness and other demands on time, we had expected a smaller crowd. Norma Dickerson braved the rain and had the Country Store open and arranged for singing before we arrived. Dan Brittain managed to make the drive from Harrison and the Crawford County gang - Gail Cowart, B. R. and Katy Black - drove up from Mountainburg. Well, we had a quorum and managed an interesting and fun afternoon in spite of the weather. Dan had enough pupils for a mini-school and so we learned several Sacred Harp songs that are written in two-part and three-part harmony that are less frequently sung. We also sang a good number of the old favorites. All our voices lasted long enough to make the trip to Springdale more than worthwhile and we then dispersed early so that everyone could head home in case the next set of storms made travel more difficult. Sunday's big news at the singing was that Dan Brittain will be flying to Europe in September for three major Sacred Harp Singing events in the United Kingdom and Poland. Dan's first stop on the schedule is the 17th Annual United Kingdom Singing Convention on September 15-16 at the Winnersh Community Centre, in Wokingham, west of London. Then Dan travels to the Wichrowe Wzgórze Conference Center in Chmielno, Poland, where he will join David Ivey and other distinguished American and European Sacred Harp singers in the first Camp Fasola Europe from September 17th through September 21st. Then Dan and the other singers head to Warsaw University to participate in the First Poland Sacred Harp Singing Convention on September 22nd and 23rd. All together it sounds like a wonderful trip. Frequently leading singing schools and seminars, Dan has always been one of the pillars supporting Sacred Harp singing in western Arkansas and particularly the Shiloh Sacred Harp Singers at the Shiloh Museum in Springdale, I'm sure all the Shiloh Singers will be looking forward to hearing about the trip (and seeing trip pictures) when Dan gets back home again. Before he left with his family for a vacation in Florida and Georgia, Syd Caldwell did pass along the news that Mr. and Mrs. David Moseley are the proud parents of a baby girl and Ian has a new baby sister. Named Elsie Violet Moseley, we are already looking forward to adding Elsie's voice to the group any time she wants to sing too. Congratulations all around. We've heard from Syd as well as recent Shiloh Singer, Shannon Seyler and her husband, Randal, over the past several days. Shannon was busy getting prepared for the storm and Syd was enjoying the beach during the calm period that usually precedes a major storm. At one point Hurricane Isaac was actually aimed in their direction but then the storm shifted westward over the next several days. At last word, both received heavy rains while Hurricane Isaac made landfall west of New Orleans. Our prayers are with all those along the Gulf Coast as Isaac moves north into Louisiana. If you happen to be traveling in Indiana or live within range, the 4th Annual Flora Cooper Book Singing is scheduled for September 29th from 9:00 to 3:00 in Flora, Indiana. 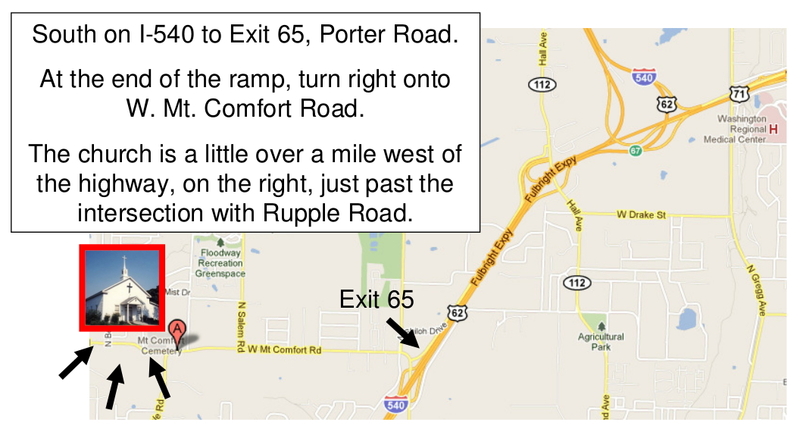 Click this link for a flyer with a map and more information. From the long range planning standpoint, the Annual NWA Fall Singing at Mount Comfort Presbyterian Church west of Fayetteville is scheduled for the Saturday before the 4th Sunday in October. That's October 27, 2012 when I try to find it on a normal calendar. We'll try to post more details and a map in the September newsletter and make decisions about the dates for the November and December monthly singing to avoid Thanksgiving and Christmas. First the formal business and then the "fun stuff"
The original purpose of these monthly updates was to send a reminder to singers who attended one of our singings or other events that we would be gathering on Sunday for our monthly singing at the Shiloh Museum of Ozark History in Springdale. That's true for this Sunday, July 22nd, at 1:30 P.M. as well. Last month, all I could guarantee was that the weather would be cooler in Springdale that it was going to be in the River Valley area. It was several degrees cooler north of the I-540 tunnel, and we had a large fan to help circulate air. This month, Gail Cowart and Bill Caldwell have volunteered to bring extra fans to help keep the cool air from the air conditioner circulating inside the store. We'll also have water and other drinks in the cooler. Cookies are always welcomed. Dress comfortably, think cool thoughts, bring your cardboard fans and we'll all gather together and enjoy singing some "cool" Sacred Harp songs during the afternoon. 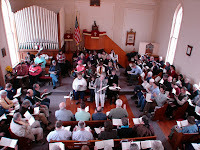 Picture: We had a wonderful singing with a good turnout last month. One of the highlights was as David Moseley stood in the center of the square to lead the singing, his son decided to help, stood up and led with his father. We always have room for new talent in our group! Thanks to Bill Aplin in Samson, AL, for so quickly getting a box of Cooper Books in the mail. The new books will be available on Sunday. Over time, our existing supply of Cooper Books had dwindled as more singers purchased their own copy to enjoy. 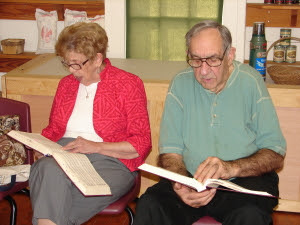 The Shiloh Singers are blessed to have singers who enjoy singing from all three of the song books used in our area. Michele, thanks for sharing. Sounds like a very lively group of singers you're singing with. That's all the news I can think of at the moment. However, as you can see, your suggestions and sharing information about Sacred Harp events and news is certainly appreciated. If there's more news after the singing on Sunday, I'll update this page or publish the news in the next newsletter. It's been two months since our last get-together and people my age do tend to get out of the habit of doing things very quickly. So just in case you didn't mark your calendar, the Shiloh Sacred Harp Singers of NW Arkansas will be back in the country store on the shady grounds of the Shiloh Museum in Springdale on Sunday, June 24th at 1:30 P.M. for another afternoon of singing from the Sacred Harp, the Missouri Harmony and the Cooper song books. UPDATE 6/26/12 - Thanks everyone for making the effort to attend the June singing. There were 26 people - men, women and children - in the country store on Sunday afternoon and everyone seemed to have a wonderful time. We're working to get more Cooper books. Syd Caldwell sent me an email on Thursday, 6/21, around supper time, " Hey, don't forget about the newsletter." I was actually looking for an introduction to start the newsletter after not having a meeting last month and Syd gave me a good way to start on the email newsletter. I think I had "writer's block" or I may have actually been out of the habit. But I smiled the whole time I was writing the email version of the newsletter Thursday evening. Like other singers in the area who missed having the May singing, Katy and I have been looking forward to seeing everyone and catching up on the news now that school is out. We both hope everyone who was either on the road or attending other functions last month had as much fun as Katy and I did on our trip across the country. Katy and I got to briefly visit with Michelle Raine and Shannon Seyler, and have the pictures to prove it. Both are doing fine and sent their best wishes to everyone in the group. I'm sure there will be stories to tell during the breaks at the singing. One of the pieces of good news for the weekend is that it will be cooler in Fayetteville and Springdale on Sunday with temperatures in the mid-90's. South of the mountains, in Fort Smith and the river valley, temperatures are expected to achieve over 100 degrees. So bring your own cardboard church fans, dress as comfortably as you can and think cool thoughts. Katy and I will plan on bringing an ice chest with cool water and an electric fan to at least keep the air-conditioner's cool air in circulation. So dust off your song books and join us at the Shiloh Museum on Sunday afternoon. Hope to see you there. I sincerely hope that the number of people in our group who will be traveling in May is evidence that the economy is starting to improve. I suppose the discussions about travel plans started at the NWA Sacred Harp Singing Convention in Harrison and Syd counted up all those who plan to be traveling or who have other commitments on May 27th, the 4th Sunday. So far, it looks like our group will be about eight "regulars" shy of a quorum in May. Accordingly, Syd suggested I publish the May newsletter early and let all the Shiloh Singers know so people won't drive a great distance only to find a sign on the door of the country store building that the singing had been canceled. So please help spread the word to any of the Singers or friends who might talk with during the next week or two in case they missed getting the email and plan to attend the May 27th singing. Syd also contacted Susan Young at the museum who will post a note about the cancellation on the door prior to the scheduled singing. I know everybody hates to cancel a singing, and none of us want this to become a habit, but it looks like the right thing to do in this particular case. Saint Johns Episcopal Church in Harrison hosted the NW Arkansas Sacred Harp Singing Convention on May 5th. Twenty singers and guests enjoyed a good singing and a well-supplied pot luck lunch in the Parish Hall. Thanks to Dan Brittain for coordinating the event and getting the word out to all the regional singers each year. And a special thanks to the cooks, who as usual, brought out their best recipes for the mid-day meal. Gail Cowart reports that the Discovery Box Project continues to make excellent progress. Gail had two HD video cameras at Harrison to help record some of the singing for possible use with the instructional video planned for the Discovery Box. But Gail was most enthusiastic about the recent video taping session with the Youth Choir at First UMC in Fort Smith, "The Youth Choir is the best." Dan did a good job training the young singers in a special shaped note singing workshop that was recorded. Before the workshop was over, several young singers were standing in the center of the hollow square leading the group. "Holy Manna" (thanks Mary Ellen ) is their favorite song and Gail hopes the young singers will sing it at one of the church's regular services next Fall. After the Youth Choir's special Mother’s Day program, the Youth Choir is on summer vacation. On the afternoon of April 25th, Gail Cowart and his committee of Discovery Box volunteers made a video recording of the Youth Choir at First Methodist Church, in Fort Smith singing shaped note music. According to Gail who has already reviewed most of the video, the results were "excellent." He also added, "Thanks to the Youth Choir, Nancy Vernon, David Whiteis, Dan Brittain and everybody else. This is exciting, just excellent. The singers were perfect." Everyone working with the Discovery Box project was looking forward to this special afternoon and those present at the recording session were impressed by how quickly the young singers adapted to the historic form of shaped note singing. When finished, the Discovery Box will be shared with other young students, about the same age, who want to learn more about how music was sung over 150 years ago, brought along with pioneers who moved into Arkansas from their original homes in the east. That traditional form of singing is still maintained by groups of shaped note singers all over America. The Shiloh Museum of Ozark History in Springdale maintains a number of Discovery Box educational activities that can be loaned to interested teachers in the area. To paraphrase what Garrison Keillor says about Lake Wobegone. "It's been mostly a quiet month for the singers in Northwest Arkansas." Things sort of broke loose in a few places nearby during April but at least the weather for April's singing at the museum was sunny and cool in Springdale. Picture: Mary Ellen Wilkinson and Gail Cowart singing bass at the March 25th singing. After a very active March with two activities at the ALHA convention in Fayetteville, work on the Discovery Box to share shaped note singing with younger singers, and our usual monthly singing, April has been mostly quiet. That ended Sunday, April 22nd, at 1:30 P.M. at our April Singing in the Shiloh Museum Country Store when we opened a door or two for our monthly singing. We had a good singing with several visitors we've added to the mailing list. We hope they'll join us again. Please keep Rev. Randi and Joe Henderson in your prayers as Joe recovers from his accident. I hope we'll have an update on Joe's condition on Sunday. Second, Susan Young had also asked earlier before the singing that we also keep Becca Martin Brown and her husband Larry in our prayers this month. Larry is fighting terminal cancer. Those in the NWA may know Becca as the feature editor of The Morning News or for her support for the museum and its many activities. Syd Caldwell had just returned from Alabama where he attended a singing at Old Harmony Primitive Baptist Church. Syd shared pictures and videos with the group. 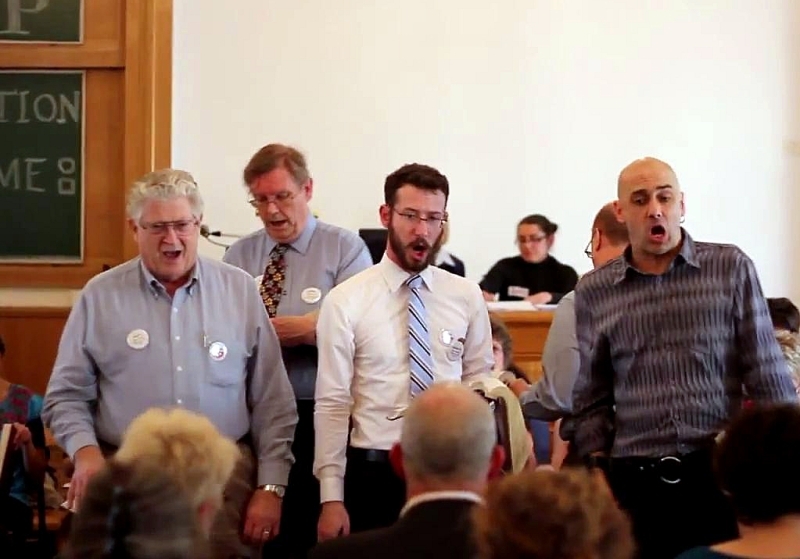 In the video below, Margie Smith leads "Weeping Sinners" 108T from The Sacred Harp. Syd, thanks for sharing. Hope to see everyone in Harrison on May 5th for the NWA Sacred Harp Singing Convention. The effort to spread the word about Sacred Harp singing as a traditional form of folk singing seemed to be a great success. Dan Brittain led a three hour workshop entitled "Historic Shape Note and Sacred Harp Singing" at the Prairie Grove Battlefield State Park on Friday afternoon, March 2nd. 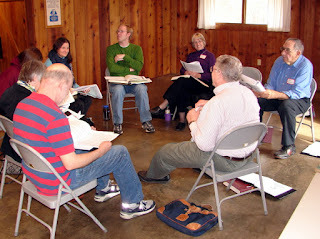 The workshop drew six participants and plus three regular Shiloh Singers in addition to Dan. Several of the workshop participants were already quite accomplished singers and soon filled the meeting room in the old log barn with song. Just before lunch on Saturday, March 3rd, a shorter 45-minute concurrent conference session gathered 16 participants for a quick introduction to the history of Sacred Harp singing in Northwest Arkansas using the 2009 video made with a grant from the Arkansas Humanities Council and the Shiloh Museum of Ozark History in Springdale. Dan then involved the group in singing a few shape note songs followed by a spirited question and answer session. Dan answered as many questions as asked and nobody missed lunch, but if questions asked are a measure of participant interest, I think both session participants and the local singers enjoyed the concurrent session. A special thanks to our hosts from ALHA, the Prairie Grove Battlefield State Park staff, and the Shiloh Museum staff who helped us at the workshops and conference sessions. We appreciated everyone's hospitality and all that was done to make the conference sessions a success for participants and presenters. Of course, we welcome any of the ALHA participants to any of our monthly singings and two area singings in May and October. More about the May event below. The Missouri State Sacred Harp Singing The Missouri State Sacred Harp Singing Convention was one for the record books. Not a cloud was in the sky at 9:00 A.M. as we arrived at St. Johns United Church of Christ near the Missouri River about 20 miles NW of Washington, MO on Saturday. Syd Caldwell and other Arkansas singers were already saying "hello" to friends and singers from as far away as Wisconsin and Georgia and Alabama. By 10:00 A.M. on Saturday, the best educated guess on participants was over 140 people had arrived to sing. Singers were using the balcony and of course more arrived or had to leave for other commitments during the day, but Saturday was a wonderful day for Singing. Sunday's rainy weather started to build up toward the west, so several of our Arkansas singers decided to travel home in as much daylight as possible. Click on individual pictures in the slide show or print pictures from the Picasa album. The St. Louis Shape Note Singers and convention participants provided an abundance of food for Saturday and Sunday's Dinner on the Grounds and hosted a Saturday night social with BBQ and desserts for those singers staying in the Washington, MO, area overnight. I commented to one of the St. Louis singers that the meals were as well organized as any I had seen at a Disney World convention. Thanks to all our St. Louis hosts. They really know how to put on a wonderful event. The NW Arkansas spring singing convention will the held in the parish hall of St. Johns Episcopal Church in Harrison, AR. A pot luck Dinner on the Grounds will be provided, so you can bring your own special dish or dessert. An information sheet in PDF format includes a list of AAA rated motels and phone numbers in Harrison. We appreciate Dan Brittain's efforts to make the arrangements again this year and I'm sure more details will be discussed at the March and April singings. Please mark the date on your calendar and share the information about the singing convention with anyone who might be interested in attending. I ended up playing to program while consulting the play list in a separate browser window so I could easily see the name of the song, the composer, and the name of the record, CD or group singing each tune. If you get a chance, check out some of the many musical variations that have sprung from such simple beginnings, and check out some of the other program offerings available from WBGH. Thanks Alexis for being the catalyst that led to finding such an interesting website. We never waste a good Google search! An introduction to the historical style of shape note and Sacred Harp singing. Learn why, where, and when shape note singing became part of our history. 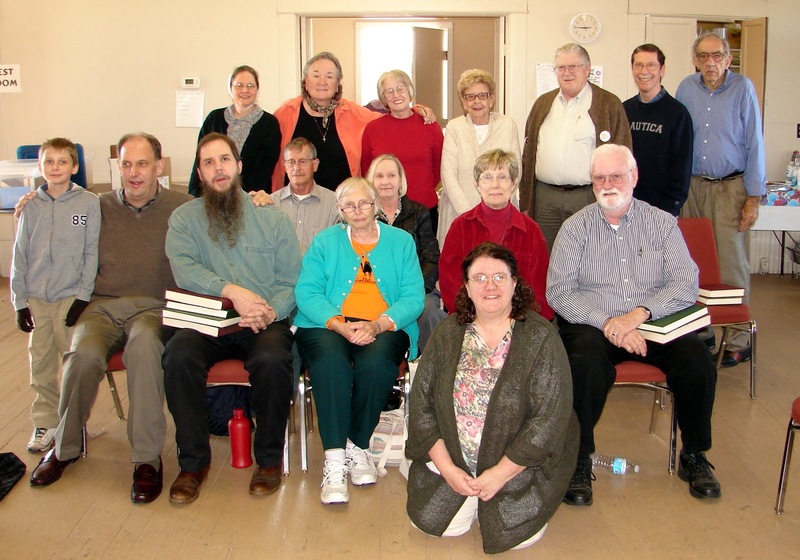 Develop your own ability for Sacred Harp singing so you can introduce it to others. Musical talent is not necessary, just the desire to make a joyful noise! We particularly need to have as many of our regular singers as are able to attend the singing school to help the new singers in the different sections. As we've seen in so many of our own singing schools, it helps if all the various voices are represented. Then on Saturday morning, March 3rd, from 11:00-11:45 A.M., Dan is leading a conference session in the Dogwood Room at the Town Center in Fayetteville. This session is an introduction to Sacred Harp and shape note singing. Included is the history, music structure, learning method and singing from the Friday workshop. 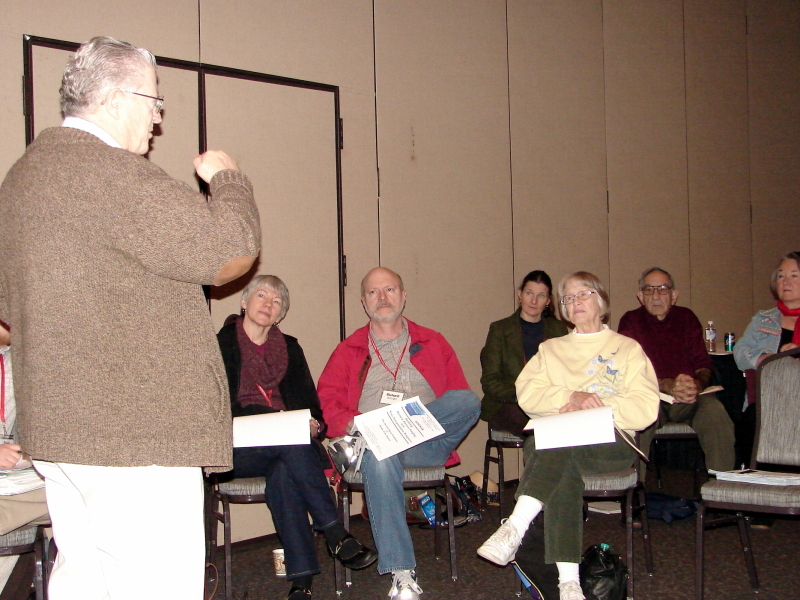 The final session topic outlines resources available to help bring Sacred Harp singing into your communities. Part of the seminar includes singing a couple of the songs learned during the Friday workshop. Again, we need a few regular singers to help the inexperienced participants during the session. Dan and Gail Cowart have been hard at work on the workshop materials and CD's being used as part of the program. It already sounds like a fun time and an excellent opportunity to increase public awareness about shape note singing and our NWA singers. The 27th Annual Missouri State Sacred Harp Singing Convention will be held at St. John's United Church of Christ near Marthasville, MO, on March 10th and 11th. Singing from 9:30 A.M. to 3:00 P.M. each day with a traditional "dinner on the grounds" each day. The Missouri State Singing Convention has become an annual "go-to" event for a number of the Shiloh Sacred Harp Singers and about 10 singers from the local area are expected to attend this year. 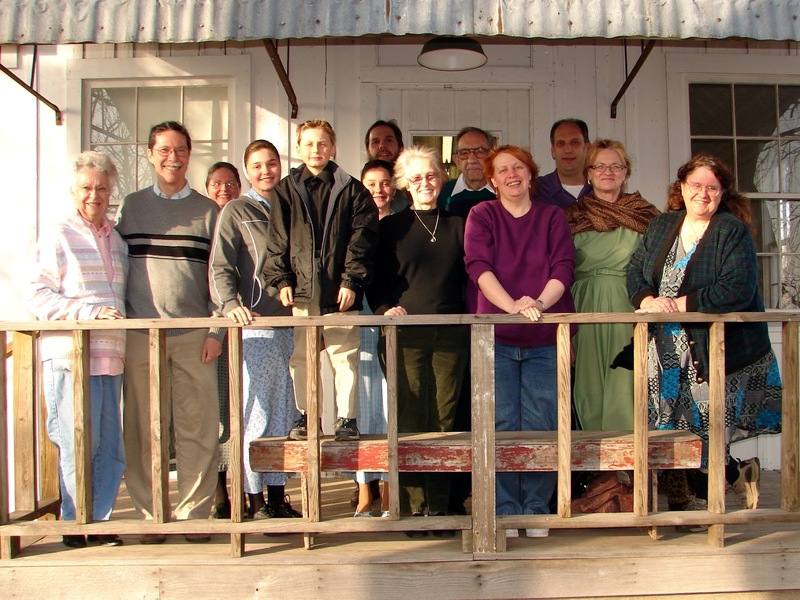 Welcome to the revised Shiloh Sacred Harp Singers of Northwest Arkansas website. This is the new home for information about the Shiloh Singers. Thanks are due the site's original webmaster, Shannon Seyler, who graciously allowed the Shiloh Singers to move her original work, the content and links from her original webpages, to this site. 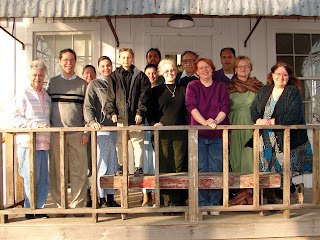 Shiloh Singers at the Shiloh Museum's Country Store on January 22, 2012. Click on picture for larger image. Thanks also to the Shiloh Museum of Ozark History, which allows the Shiloh Sacred Harp Singers to meet once each month on the 4th Sunday, 1:30 - 4:00 P.M. in the Country Store on the grounds of the Shiloh Museum, at 118 W. Johnson Ave., Springdale, AR 72764. Please keep in mind that singings in the months of November and December may be changed to accommodate Thanksgiving and Christmas holidays. Meeting changes will be announced on this site. This site is built using Google's Blogger and will be hosted at no cost on blogspot.com. Additional features and links will be added as time permits. A calendar of events will be posted near the top of the sidebar so that singings or special events can be easily confirmed. Pictures will be stored in PicasaOnline and eventually you'll be able to click on most pictures of people and events for a larger version of the picture you can download and print on your own computer. However, this site will be a work in progress for a while as we respond to ideas and suggestions from the members. You can also help if you have a link to a site that we overlooked or have not had the time to add yet. We'll add it to the list of things to do. I don't plan to make a large number of updates or entries each month, but comments or suggestions are always welcomed. Or if you wish to pass along news of a Sacred Harp singing or other news item of special interest to our singers, feel free to contact us directly via email. We hope you will enjoy the site and find it useful.